GoodReads Summary: Ten creatures await, camouflaged in artful, full-page photographs, while playful poems offer clues about each animal's identity and whereabouts. Think you've spotted one? Lift one of ten gatefolds to find out. A full page of fascinating information accompanies each animal so readers can learn how nature's camouflage serves hunter and hunted alike. Why do fawns have spots during their first year of life? How did killdeer birds get their name? What makes a crab spider so good at ambushing its prey? What I Think: This book is brilliant. 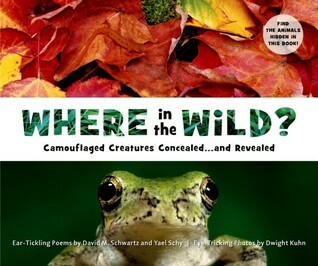 It's fun to see animals and how they camouflage themselves but this book makes this an interactive activity in a few ways. First of all, readers have to search for an animal hiding in the photograph. There is a page opposite the picture with a poem that gives you a hint as to what you are looking for. After you find the animal, you unfold the page and find out if you did in fact find the animal you were supposed to find and then you can read a little about that animal. I had a blast reading this with my family and with students. Everyone, from my pre-k son, to my 3rd and 4th grade students, to my husband, were determined to find the hidden animals. After we did all the work to find the animals, we really wanted to read more about them. It was a great experience. There are numerous ways to use this book in a classroom. There aren't many non-fiction text features but there are some. I have been using it to listen and then identify the main ideas of the text. The poems really make kids think because they are like riddles. It would be neat to read just the poem before even letting kids see the photograph. They could listen and decide what animal they should be looking for, then you can give them time to look. It would be good practice for making a prediction even though this is a non-fiction text. The color in this book is amazing. It really brings the ideas to life. "Moths are nocturnal – they fly and feed at night. Some are expert fliers who can evade even the fastest bats. But during the day, a resting moth is easy prey for hungry birds. By blending into it surrounds, a moth that is well-camouflaged can sleep undisturbed. The larvae of certain moths are called inchworms. These moths are known as “geometers,” meaning “earth measurers.” As a larva inches its way along a twig, it seems to be measuring it. In England more than a century ago, a kind of geometer called the pepper moth had light-colored wings that were “peppered” with dark specks. Pepper moths hid well on light-bardked tress blotched with grayish lichens. After factories began to pollute the air in industrial cities, soot from the smokestacks darkened the tree bark. In some areas, the moth populations evolved to be darker, matching the trees on which they rested. By doing this, they continued to evade birds looking for a mothy meal." Writing Prompts: Choose one of the animals from the book and do some extra research on the animal you chose. Write an expository paragraph about what other interesting facts you learn about the animal.